We are the official UK distributor for Mooij Agro storage systems. Mooij Agro is a global innovator in agricultural storage, offering outstanding bulk, box and bag storage systems for vegetable produce. With positive pressure technology and simple touch-screen management, Mooij Agro storage offers a unique range of benefits. Bradley Refrigeration can provide advice on which Mooij Agro storage system fits your needs. We can build Mooij Agro equipment into your custom agricultural solution, as well as supplying, installing and maintaining your system. We offer a wide range of systems. Store vegetable produce in bulk before it is processed, for extended time periods. The Mooij Agro Bulk Storage System delivers cooling, heating or humidity control, depending on requirements. Systems can include fans, air inlets and outlets, measure and control equipment and air distribution. The Mooij Agro Box Storage System makes it easy to separately store a range of different produce. 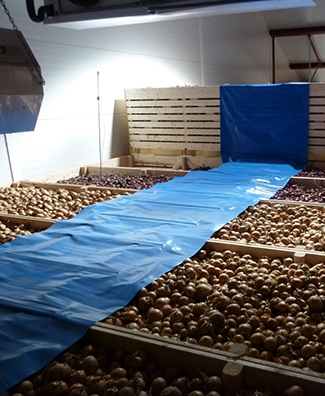 The system is ideal for seed and ware potatoes, onions, and other high-value crops. Additional equipment can include aspiration, pressure ventilation airbag, pressure wall and room ventilation systems. For farms that bag their produce in the field, the Mooij Agro Bag Storage System is designed to reduce wastage and save as many bags as possible. Bag racks and bulk-purchase storage bags can be supplied as part of this system. To find out more about the benefits Mooij Agro can offer your business, talk to our team today. We can offer expert advice, a free site survey and bespoke solutions. Call us on 0114 236 9971 or email us.